Ada Hotel rich with natural beauty located in seafront offers a great service to guests visiting their hotel with good service of friendly nature. This hotel suits well for "honeymoon couples" as the surrounding is very romantic and calm. The staffs working in this hotel are well experienced and help the guests to a maximum level because of all the hospitality provided by this hotel stands first when compared to other hotels in the surrounding region. 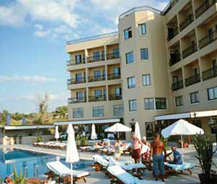 This hotel is located in Karaoglanoglu which is at a distance of 5 kms from Kyrenia in the direction of west. It has a swimming pool to its right and it offers guests all time entertainment with live music in day times. On every Saturday hotel arranges for ADA HOTEL CYPRUS NIGTH in its beach with open buffet of traditional Cypriot mezes and kebabs and home made desserts. Another specialty in this Cyprus night is that any well known restaurant of the island offers the best French cuisine and also delicious foods such as fish, kebabs, and all sea foods with taste. The hotel has 3 suites and 18 standard rooms with balconies offering a beautiful view of sea and mountains, bathrooms with shower facilities, air conditioning, dryers, and etc.